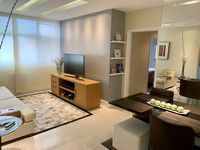 Property 7: DUPLEX IPANEMA PENTHOUSE POSTO 9. Jacuzzi, 2 Terraces + Wow Cristo Views! Property 12: DAILY PROMOTION 250 !! BEAUTIFUL FLAT VARANDA, KITCHEN, STOVE, APART HOTEL 10! Property 13: 10 people comfortably! Near the best of Rio! Charming home! Swimming Pool!View! Property 20: Large Lux Apt Ipanema Beach NEW LOW RATES! Property 27: ENJOY EASTER'S EVE AT THE HEART OF LEBLON! Property 34: Artist two bedroom apartment very near the metro, in the heart of Copacabana!! Property 35: Spacious 2BR in Rio's most upscale neighborhood! Best value in Luxurious Leblon! Property 40: Family friendly, large, natural light, charming, cozy. Copacabana of the 50's. Adoramos a recep&ccedil;&atilde;o do propriet&aacute;rio, apartamento organizado e higienizado, bem localizado. As imagens que foram postadas para a loca&ccedil;&atilde;o do im&oacute;vel condiziam com o que encontramos. Os funcion&aacute;rios da recep&ccedil;&atilde;o do pr&eacute;dio foram excelentes e cordiais. Esperamos retornar em breve. Muito obrigado.